Although small amounts of mercury occur naturally, high levels can be dangerous, causing neurological and reproductive damage in animals and humans. In fact, the 1990 US Clean Air Act listed mercury as a toxic pollutant, in part because it accumulates in fish and other marine creatures and then bioaccumulates in humans who eat seafood. So where does all this mercury come from? Volcanoes spew about half of the mercury found in the atmosphere, and small amounts leach from bedrock. The other half is from human activities, including coal-fired power plants, mining, and smelting. Human-generated mercury emissions have risen significantly over the past 200 to 300 years, producing atmospheric concentrations far higher than pre-industrial levels. The team Schaefer worked with discovered the mercury by drilling 13 permafrost cores across Alaska. They carefully sliced the cores, freeze-dried them, and then ground up the samples using ceramic knives and other protective measures that would not contaminate the core’s chemical composition. After measuring both mercury and carbon content, they verified their findings against a larger swath of samples gleaned from published research. Sifting through more than 11,000 measurements taken in temperate and boreal areas led the team to realize their data lined up with the broader record. Permafrost indeed held more mercury, 1,656 gigagrams of it, which is equivalent to 32 million gallons, or 50 Olympic-sized swimming pools. This mercury depositing and cycling occurs all over Earth’s surface, so why does Arctic permafrost hold so much of it? The same processes govern mercury accumulation in both the tropics and the Arctic; the difference is the presence of permafrost. 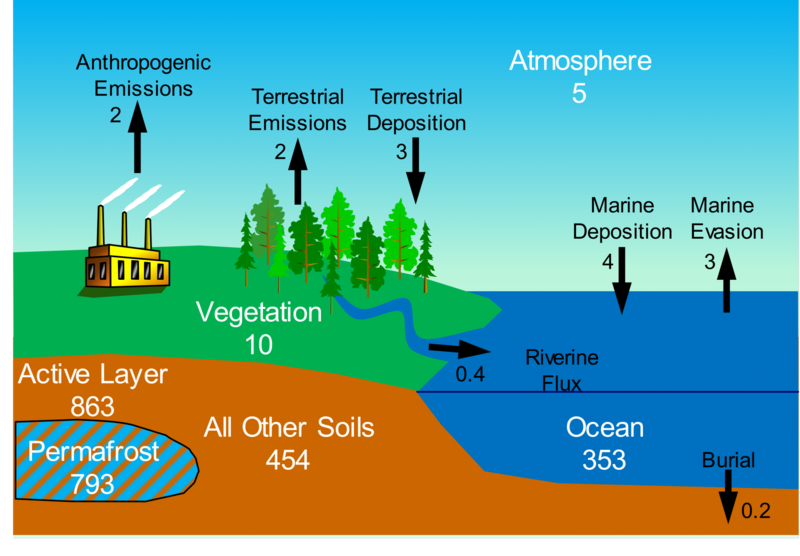 Tropical areas and non-permafrost regions have more organic matter and more receptor sites with which to bind mercury, meaning mercury is consumed and cycled back into the atmosphere or water more quickly. “But in the Arctic, it’s cold, and the soil freezes,” Schaefer said. “There is a slow decay rate, so there’s a slow buildup of mercury within the permafrost.” Mercury is still depositing from the Arctic atmosphere, but the microbial processes that consume mercury function much more slowly in frozen soil, meaning mercury accumulates rather than being cycled through. Schuster, P. F., K. M. Schaefer, G. R. Aiken, R. C. Antweiler, J. F. Dewild, J. D. Gryziec, A. Gusmeroli, G. Hugelius, E. Jafarov, D. P. Krabbenhoft, L. Liu, N. Herman-Mercer, C. Mu, D. A. Roth, T. Schaefer, R. G. Striegl, K. P. Wickland, and T. Zhang. 2018. Permafrost stores a globally significant amount of mercury. Geophysical Research Letters, 45.